I'm excited for the coming updates. I can't believe how cool this is, it's like an official game. A couple things I noticed, all the sprites seem to be the same color, no blood. I blasted through the first few levels, but I'm gonna hold off finishing the game until I can see some blood. Also, underwater navigation is pure luck finding your way around. About bump mapping, does that mean we'll see lights bouncing off the textures? Does the engine judge that automatically? Anyway, thank you, I'm super excited to see this kind of home-brew on my vita. Video of the 2.5 version. Great work Rinnegatamante. It works flawlessly, except some slowdowns here and there when there are many enemies on screen, underwater and when there are lots of effects (usually close explosions). I want to try that sweet mod support. I hope you can add the vitaGL hardware acceleration to your Q2 port. Last edited by stranno on Mon Jan 22, 2018 10:04 pm, edited 1 time in total. Hey! This is absolutely awesome work! The vitaGL support is freaking awesome. Native res at 60fps is a beautiful thing to see! Shame not a lot of games actually made for the system run that way. v2.5 is really great, but I do want to point out some issues I've found playing it for the past thirty minutes or so. I played a E1M1 of the main game and everything seems to be running pretty great. No hiccups, not even once! Underwater effects aren't working at all though, which makes some parts of levels unplayable due to the inability to navigate through the areas. There is some noticeable texture glitching in some areas, but more often than not these are repeated textures and not unique ones like for buttons or doors so it isn't too big of an issue. Mods are still working, but the mod selection menu is not. I've noticed that the game boots a lot quicker now, so maybe it is too fast to register the R button being held to bring you into the mod menu (unless the hotkey changed; I tried a few other buttons to no avail). Editing the ux0:/data/Quake/mods.txt file with the game folder you want to launch still works okay though. I tested this with the official Hipnotic map pack. One thing I'd recommend if the mod menu isn't going to work anymore is to allow add a mod selection option to the settings menu similar to the one the DirectQ port has (pictured). I did notice that enemies run at a significantly lower framerate than the environment, but I think that is because model interpolation is disabled. I tried enabling it through the console, but it wouldn't recommend any of my winQuake commands (unless I had the wrong ones). One thing I would like to add that isn't a bug report but rather a feature request is the option to disable texture filtering and change the particle type from circles to squares. I tried changing the settings to allow for both via the console, but the commands weren't recognized. I know those may seem like odd requests though, but for old school Quake purists, the "crunchy" look is pretty nice to have! EDIT: Turns out I was using the wrong commands to disable texture filtering. It is possible via the console by putting in "GL_NEAREST_MIPMAP_LINEAR"; this will make the textures appear in their raw, crunchy glory. The "r_particles 2" command is supposed to work in some engines to enable square particles, but it might not be enabled by default in QuakeGL-based engines. This forum post has a lot of info on console commands I tried, along with some info on the other ports out there and how each one can get the retro "look" of the original DOS version of the game. I was super stoked to see development on the port resumed! VitaGL is amazing and so is Quake, so seeing this is truly awesome! Thank you for all the effort you've put into putting this together! Underwater bug is caused by lightmaps. (For reference, using r_fullbright solves the issue but disables shadows). Currently looking for a fix. Model interpolation was not a feature of standard GLQuake, got added with unofficial GLQuake 1.13. It's something i'll add in future releases for sure btw together with bumpmapping and some other extra features. GL_NEAREST_MIPMAP_LINEAR is not implemented in vitaGL. The only two texture modes available are GL_NEAREST and GL_LINEAR. Stick with GL_NEAREST to disable linear filtering. Awesome, added the GL_TEXTURE GL_NEAREST_MIPMAP to my autoexec.cfg! Looks sublime now! Setting r_fullbright to 1 does solve the underwater issues, but greatly diminishes the experience, so I'll keep it set to 0 until a fix is implemented. It is still possible to play some levels that don't have underwater sequences though. I believe the first official mission pack has fewer underwater levels, so I might fiddle around with that. 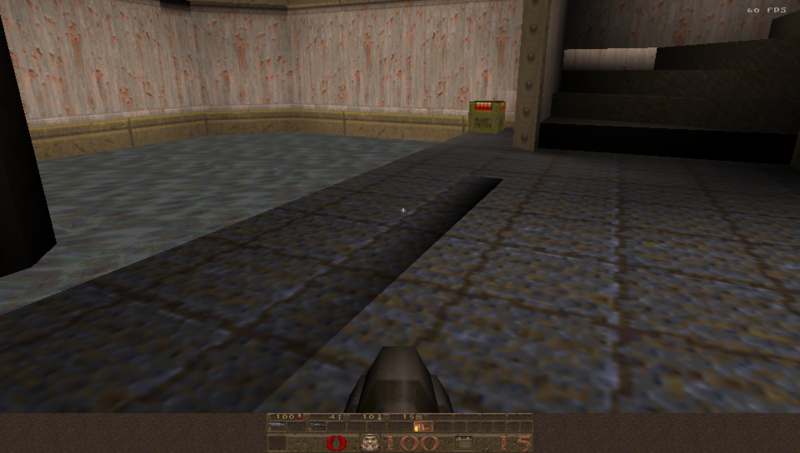 Enemy interpolation isn't the highest priority fix right now, but just something I noticed when comparing it to vkQuake on my desktop (which itself is based on quakespasm). It is cool to hear that you'll be looking into it along with bumpmapping though! I still can't say enough how awesome the port is! I know the icon and livearea are pretty okay right now, but if you'd like, maybe I can whip something up to make it a bit more special? I feel like a port of this calibur deserves some pretty livearea assets to make it shine even brighter. Just a thought! Edit: Whipped a little somethin up. Feel free to use it if you'd like! - Removed the ugly brown lines at the sides of the statusbar (look the screenshot at the end) so that it looks like Hexen II one. 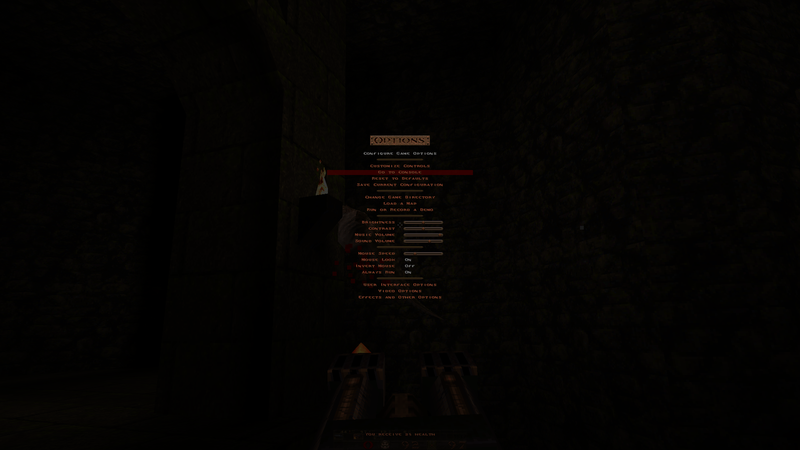 - Reintroduced demo autoplayback at game startup like original Quake. I plan to add some more features before dropping a new version even if the additions are enough already for a new version i think. Hot dang, all those fixes in just one day? It's like christmas all over again! Can't wait for the next version, it sounds like it'll really be killer! Animation interpolation works great and the lightmaps workaround makes it far more playable. Is there any interesting vanilla mod? I have tried Quake Rally and it works but it has some errors. Amazing work that got me hooked to Rinnegatamante twitter account since the first VitaGL tweets. I tested the 2.5, and can't wait to play the updated version coming soon! By the way, are you also implementing Overbright and Fullbrights lighting for this release? I can't recommend the official map packs, "Scourge of Armagon" and "Dissolution of Eternity" enough. Both run really well and are a blast to play! You might want to wait for the underwater fix though to play them just because water sections are pretty frequent throughout. Another good one that I haven't beaten but have been chipping away at is "Dopa," which was actually made by Machine Games, the people who made the new Wolfenstein remakes. By far the most impressive one with the most levels and varied locales is "Arcane Dimensions". If I remember correctly, that one came out in late 2016 with a patch in 2017. It's definitely a gem worth taking a look at if you're after that vanilla feel! I already compiled the underwater fix so i may try those. The fix itself just disable the lightmaps automatically when you enter the water so underwater environment looks a bit bland right now. I guess it will be fully fixed in the future. Arcade Dimensions is one of the best mods ever. Unfortunately it is so doped i doubt it can be adapted to Vita.